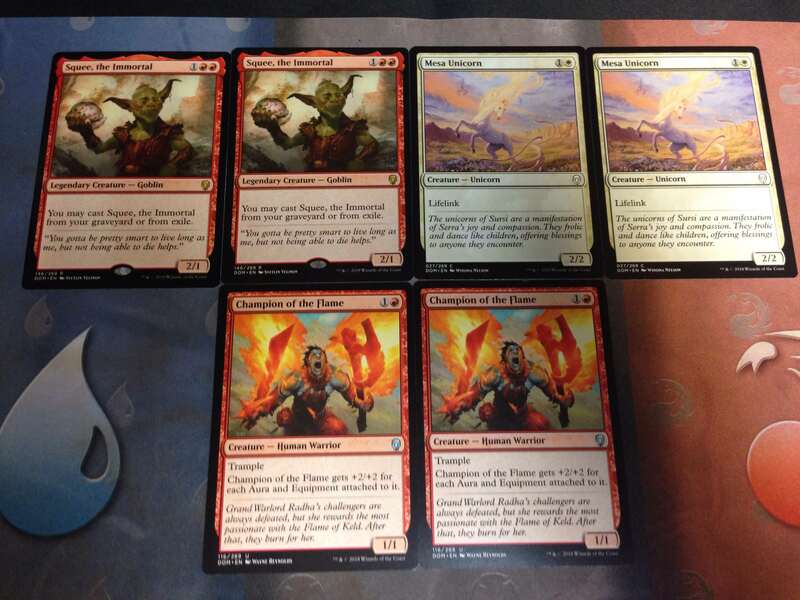 I went to FNM last Friday and tried my hand at another draft. 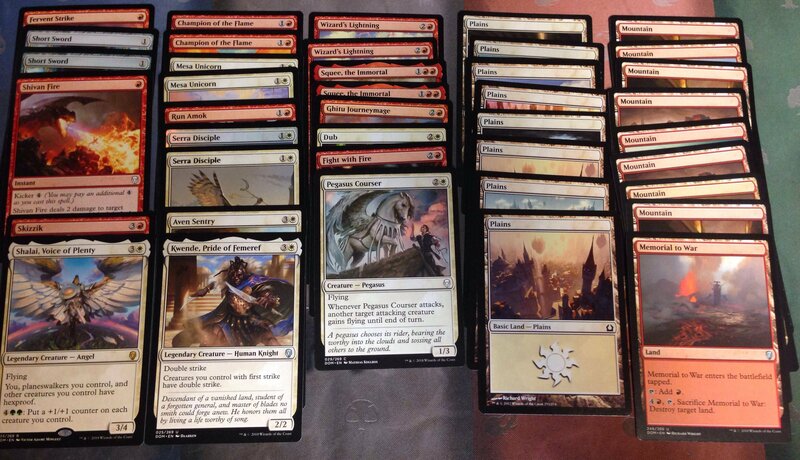 I ended up drafting a pretty brutal Red/White Aggro / Aura combo deck. I ended up losing my first match to RNG, too much land or no land. Then I won my next two rounds easily. I walked away with two packs from this one. I dub this deck Squee’s Revenge. Here is what I cobbled together. Click the images to zoom in if you want to read the cards! I had a great curve. Lots of two drops. a perfect number of spells and creatures. A good number of three drops. I even had a couple four drops that win the game, or at least put you at an advantage. I grabbed a fair number of doubles. 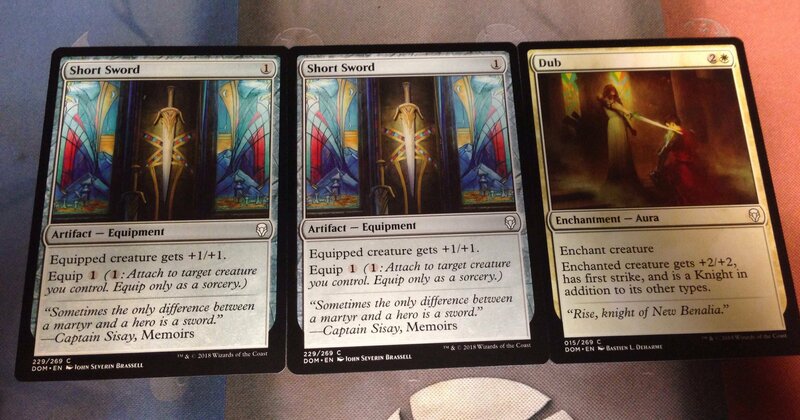 I pulled two squees. I even did a hilarious combo, where I played a squee and attacked the next turn then played a squee to have one untapped. With one squee in the graveyard and one in play he basically has vigilence. The champion and the unicorn with dub pretty much ends the game. Unless they can kill them it’s really hard to deal with a 4/4 lifelink/first strike or a 5/5 trample/first strike each on third turn! I ended up with a nice little mini air force. 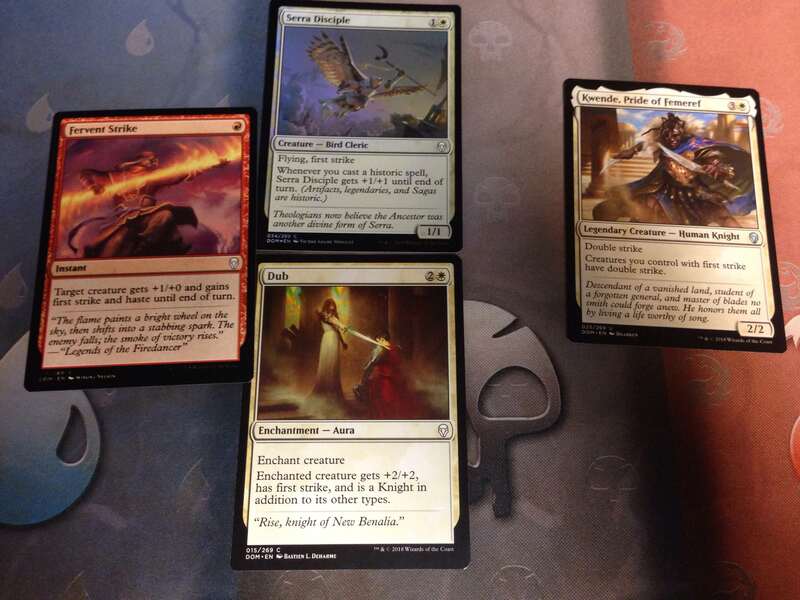 I think if you draft white, grab one unicorn that gives creatures flying at minimum. It is always going around the draft table and you can grab one late in the pack. You can then end some games if they have no flying and you magically make a 5/5 other creature have flying for even only one turn. The 1/1 aven is pretty bad, but first strike makes it a good blocker against the blue 1/1 bird that seems to be getting play in my circle. 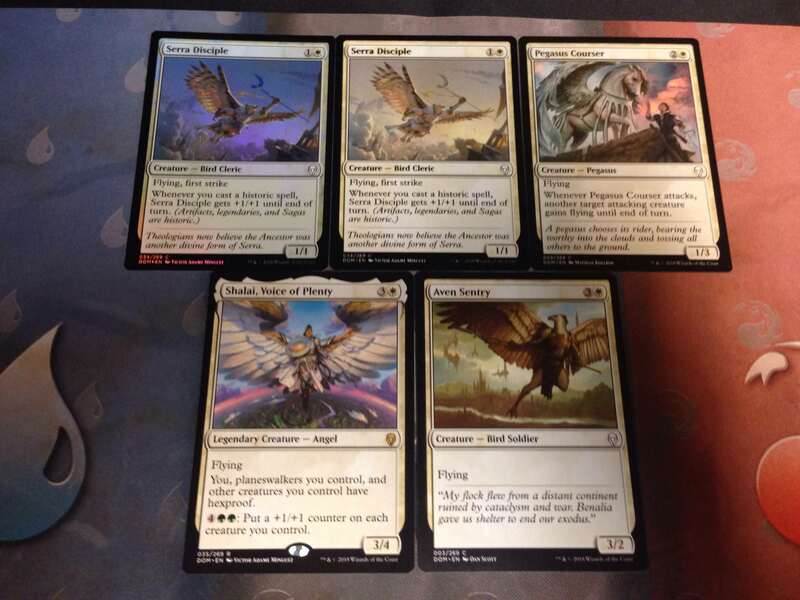 I got a nice flying white rare but only played it once. If you are drafting white you should end up with at least 3 fliers minimum. Here was my removal and tricks. I won a couple games with run amok + trample from champion and fervent strike making a creature get double strike. We will get into that combo in a minute. 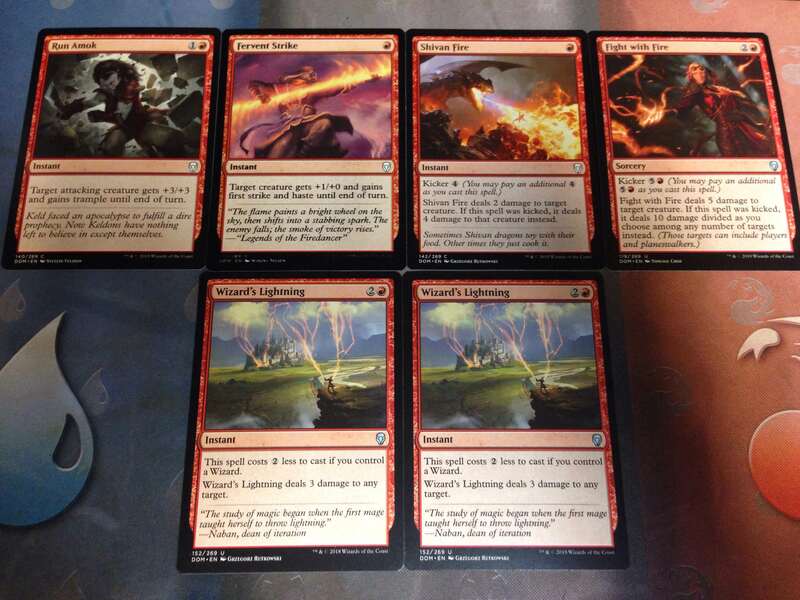 Wizard lightning is pretty much first pick if you see it. Kills nearly everything. Fight with fire is just silly if you get the kicker, but a wizards lightning if you don’t kick it. First pick in my opinion too at uncommon. I did not draft as many auras or equipment as I would have liked. 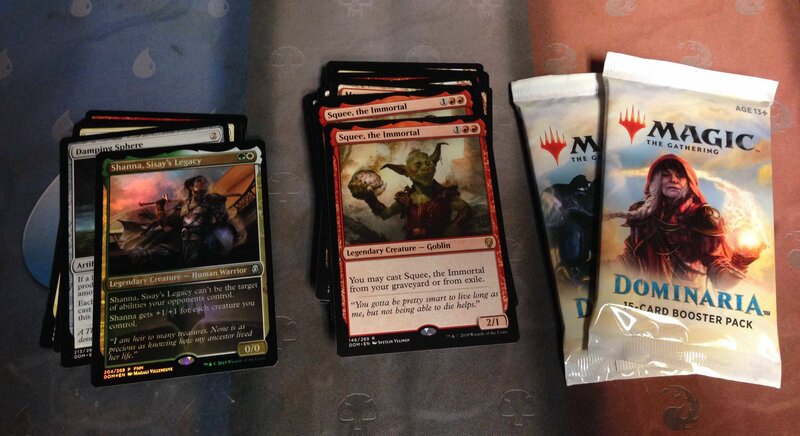 I didn’t get the champions until the end of the second pack drafting. Then the auras dried up. I managed to get lucky and see a equipment at least once on almost every game. Champion + an aura or equipment is serious business early in the game. Here is the key combo in white/red. If you see this guy Kwende in draft, first pick and skip looking at the rest of the cards. This dude turns on some crazy stuff that ends the game. I did 16 damage in one turn because I dropped him and all my first strikers were now double damage. Dub / Fervent stike automatically switch from giving first strike to double strike… dub is already overpowered. I think white in general is way OP in the set for limited. I actually did not rare draft for once. I had a strong deck coming along while I drafted and wanted to end with something great instead of value. I still swooped up a cast down and a dampening sphere. I got a promo again, same as last week. I hope you liked looking at my draft deck. What colors are you running in limited? I drafted a second time on Friday, I’ll post that deck in a day or two. I also built a league deck which I will post before Friday.